We’ve got a new look! 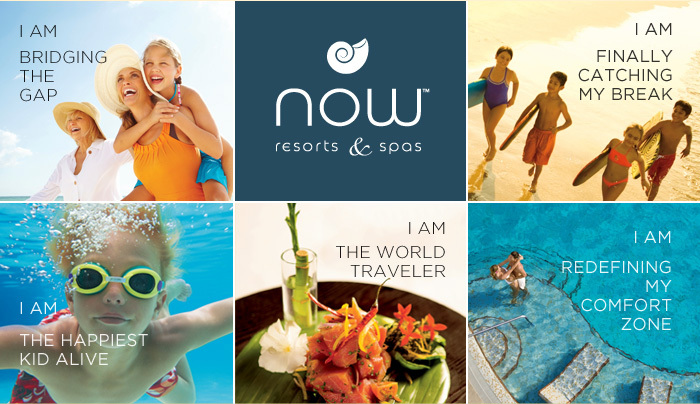 We’re redefining the meaning of an Unlimited-Luxury® vacation and showing you all of the ways to live in the moment at Now Resorts & Spas. Our fun new campaign focuses on capturing guest experiences and highlighting all of the ways to find yourself at Now Resorts & Spas. With “I AM NOW” you can picture yourself swimming, laughing and playing in the sand with friends, families and loved ones. Now Sapphire Riviera Cancun, Now Jade Riviera Cancun, Now Amber Puerto Vallarta and Now Larimar Punta Cana are all places to escape from your typical routine and start living in the now! Plan your stay with us now and start discovering a brand new way to have it all. Find yourself at Now! This entry was posted in Now Amber, Now Jade Riviera Cancun, Now Resorts & Spas, Now Sapphire Riviera Cancun and tagged I am now, Now Resorts & Spas. Bookmark the permalink. I’m going to the NOW Sapphire (preferred Club) on June 11th….I hope its’ all the hype they claim it is. It’s our 50th Wedding Anniversary..
Tax season has been brutal. We can’t wait for it to end and we can enjoy our vacation at your resort. Counting down the days. 3 weeks till NOW, can’t wait to relax and enjoy our vacation!